Georgia's former President Mikheil Saakashvili was recaptured by Ukrainian police on Friday, days after supporters managed to free him from police custody in Kiev. His latest arrest marks another extraordinary twist in a long feud between Saakashvili and Ukrainian authorities. General Prosecutor Yuriy Lutsenko said the opposition leader had been detained by police and was in a temporary detention facility. "As promised, security officers did everything to avoid extreme violence and bloodshed," he said in a post on Facebook. As of 2200 GMT, a few hundred protesters had gathered near the facility not far from the parliament, shouting 'Shame!' while a large number of police in riot gear stood guard. 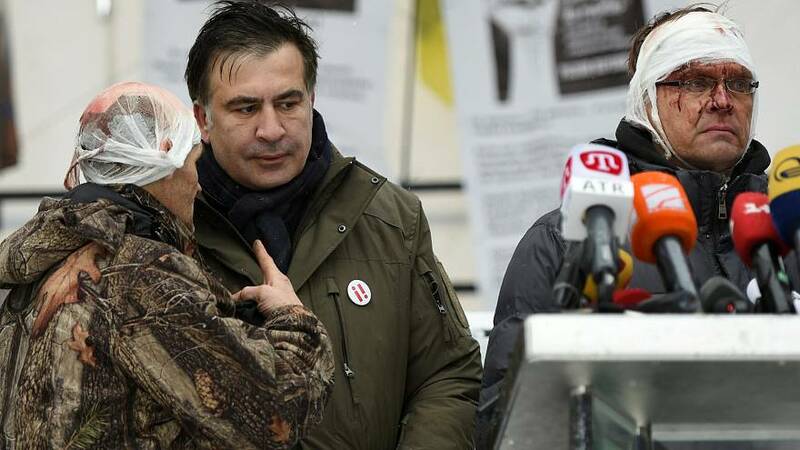 On Tuesday, amid turbulent scenes, Saakashvili's followers freed him from a police van after he had been taken into custody on suspicion of assisting a criminal organisation. Saakashvili then led protesters towards parliament in Kiev, calling for President Petro Poroshenko to be removed from office. The pair had been friends. Saaksahvili became a regional governor in Ukraine at Poroshenko's invitation. But he later turned on his one-time patron, accusing the Ukrainian leader of corruption. While Saakashvili has a core following, he enjoys limited support in Ukraine. Less than 2 percent of voters would back his party in elections, according to a recent survey.